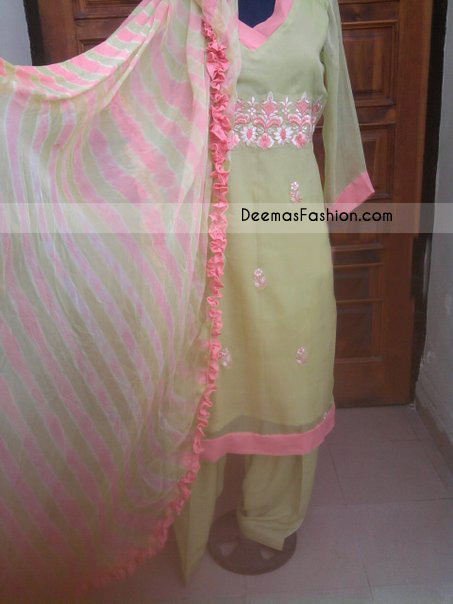 Tags: Chiffon, Light Green, Pink, Semi Formal, Shalwar, Shirt. Top: Light green chiffon top having amazing floral embellishments. Stylish neckline. Applique work of pink chiffon on hem line, sleeves and neckline. Beautiful floral motifs sprayed on front Fully lined. Concealed back zip closure. Bottom/shalwar: plain light green colour shalwar. Dupatta: two colours dye dopatta finishing with pink chiffon on edges.